Scholars exploring the history of science under the Nazis have generally concentrated on the Nazi destruction of science or the corruption of intellectual and liberal values. 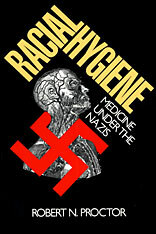 Racial Hygiene focuses on how scientists themselves participated in the construction of Nazi racial policy. Robert Proctor demonstrates that the common picture of a passive scientific community coerced into cooperation with the Nazis fails to grasp the reality of what actually happened—namely, that many of the political initiatives of the Nazis arose from within the scientific community, and that medical scientists actively designed and administered key elements of National Socialist policy. Proctor makes us aware that such thinking was not unique to Germany. The social Darwinism of the late nineteenth century in America and Europe gave rise to theories of racial hygiene that were embraced by enthusiasts of various nationalities in the hope of breeding a better, healthier, stronger race of people. Proctor also presents an account of the “organic” health movement that flourished under the Nazis, including campaigns to reduce smoking and drinking, and efforts to require bakeries to produce whole-grain bread. A separate chapter is devoted to the emergence of a resistance movement among doctors in the Association of Socialist Physicians. The book is based on a close analysis of contemporary documents, including German state archives and more than two hundred medical journals published during the period. Proctor has set out not merely to tell a story but also to urge reflection on what might be called the “political philosophy of science”—how movements that shape the policies of nations can also shape the structure and priorities of science. The broad implications of this book make it of consequence not only to historians, physicians, and people concerned with the history and philosophy of science, but also to those interested in science policy and medical ethics.